LOS ANGELES, May 15, 2018 /PRNewswire/ — There is a hidden game being played in every business that can stunt growth, made up of unspoken rules. 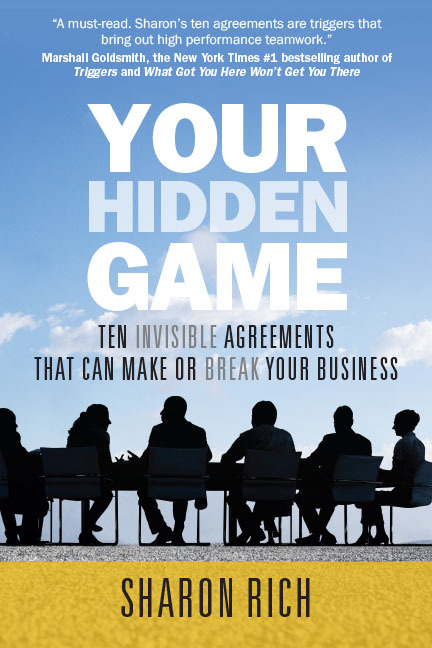 “You can’t win a hidden game,” says Sharon Rich, author of the book “Your Hidden Game: Ten Invisible Agreements that Can Make or Break Your Business,” (2018, Indie Books International). Rich has dedicated the last decade to transforming business performance by making the invisible visible as she brings hidden business games out onto the table. Prior to that she spent 25 years as a leader in the advertising business. 1. How you will talk about the business. The way your team talks about your business has a powerful impact on its ability to achieve its purpose and objectives. It’s essential that your people are aware of, intentional, authentic, and aligned about the core messages you send, both internally and externally. 2. How you will make it safe to succeed. Effective forward movement in business depends upon peoples’ ability to speak up, share ideas, take action, try new things, and even make mistakes. If these actions are too risky, information gets hoarded and withheld, problems are hidden, people play small, and they shy away from opportunities that could bring big rewards. 3. What success looks like. When people in the same organization lack shared clarity about what the organization is trying to accomplish, it pulls the organization’s efforts and resources in different directions. Bring everyone in the organization into alignment and the speed with which they accomplish shared goals will be breathtaking. 4. Where you will put your shared attention. Without clear priorities, businesses tend to accomplish what is urgent rather than what is important. They are easily pulled off-track by any number of distractions—and team members pull against each other based on differing opinions about what needs to get done. Agreeing on top areas of focus allows businesses to accomplish more in less time and with less drama. 5. Who does what—and how. The absence of clarity about how we act and interact leads to confusion and breakdowns. We need role definitions that tell us specifically how each person functions and interacts with people in other roles. Roles connect behaviors to desired outcomes. 6. How the team will decide and follow through. The success of any organization depends upon its ability to make decisions effectively, communicate these decisions clearly, implement what was decided upon, and follow-through. 7. How people will share information and coordinate actions. In school, it was drilled into most of us to do our own work and keep our eyes on our own papers. As a result, most people have developed deeply ingrained habits of keeping others at a distance. We are unaccustomed to the easy coordination of ideas, information, and action, not only within, but also between departments and functions. In business, coordination is essential for survival. Businesses that figure this out have a stronger competitive edge. 8. How the organization will respond to problems. Problems are part of the landscape of business. Performing at a high level in business means identifying and solving problems seamlessly and rapidly, minimizing disruption. 9. How you will utilize failure. Failure and success are inextricably intertwined. Every win holds within it multiple failures. The secret to success is to acknowledge this reality and agree on how your organization will approach, learn from, and leverage its setbacks. 10. How you will hold yourselves accountable. Accountability is one of the most needed—and most misunderstood—concepts in business. Trying to make people accountable creates stress and frustration throughout the organization. The missing understanding is that accountability is an agreement between people, not something imposed from outside.